These products are available at Fine Saddlery Retailers Nationwide. Click on "Dan's Dealers" to find a retailer near you. 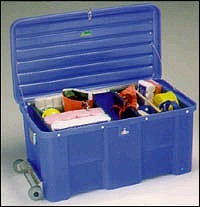 Our Duralite trunk is made of rugged polyethylene that will not rust or rot. Trunk, tote and tray are easy to clean. Durable, Economical, Weather Resistant, and Lightweight. 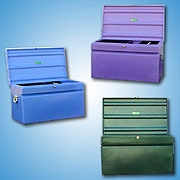 Our Smallest Duralite, This unit can be used for storing all types of equipment. It can be used in the barn or trailer, its perfect for the show circuit as well. 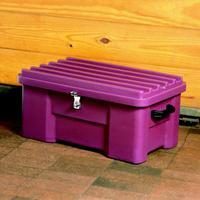 Two plastic handles make this lightweight, lockable, waterproof trunk easy to handle.